Many people seem to think that if their cat has an issue with scratching up the furniture or the carpet in the home, the solution is just to declaw the cat. Think again! Declawing your kitty can cause them to be much less likely to use their litterbox, and it can also increase the likelihood of biting. If that isn’t enough, declawing has also been known to lead to lasting physical issues for cats. Quite a few countries have banned declawing, and even the Humane Society here in the United States opposes declawing, except for when it is necessary medically (such as in the case of cancerous nail bed tumors). If you are worried about getting scratched, even if you have an immunodeficiency or bleeding disorder, your health will not be protected by declawing cats. The risk from scratches is much less than the risks from bites, cat litter, or fleas that may be carried by their cats. Cats need to scratch. It’s part of their normal behavior! They never do it to destroy your home or take out any pent-up aggression on the couch. On the contrary, they scratch in order to remove dead husks from their claws, stretch their muscles, and even mark their territory. Most cats begin scratching at around eight weeks of age. This is the perfect time to train them into using a scratching post and get comfortable with you trimming their nails. If you get a cat older than this and they have issues scratching, there are other alternatives to get them to stop. Some people think that declawing surgery is simple and is much like having your fingernails trimmed. Unfortunately, this isn’t even a little close to the truth. Declawing involved amputating the last bone of each toe. If we were to “declaw” humans, you would have the tips of your fingers and toes removed to the first knuckle. This surgery is unneeded, and it does not benefit the cat in any way. Proper pet parents can easily learn how to train their cats to use their claws correctly and not damage any property in the home. The most common method of declawing involves amputating the cat’s toes with either a scalpel or a guillotine clipper. Then, the wounds are sealed with either stitches or surgical glue. The technicians then bandage the feet. Other places will offer laser surgery, where a laser heats tissue and vaporizes it in order to cut it. While this may sound more humane, it is still removing part of your cat’s toes and carries the same risks of physical disability in your cat and a sharp increase in behavioral issues. Finally, a third option some places offer is a tendonectomy. While they do not fully remove the toes, they do cut the tendons so that cats cannot extend their claws. However, this has been known to cause thick claw growth that eventually may require full declawing. These thick claws can lead to bleeding, lameness, and infection just as a full declawing procedure can. 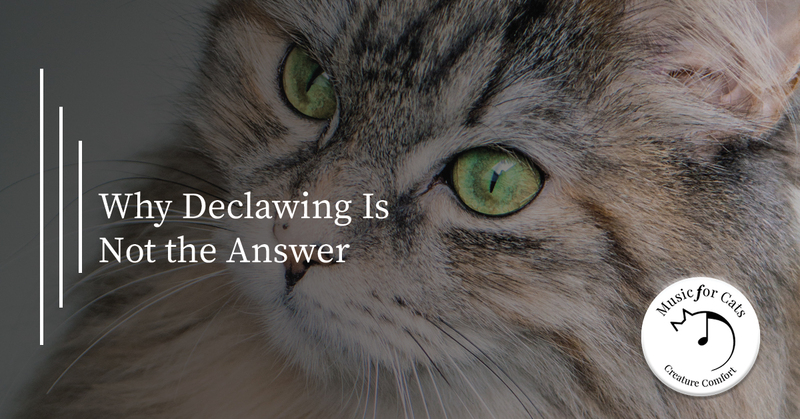 Declawing leads to pain in the paw, and it has lead to infection, tissue death, back pain, and even lameness. This is because declawing changes the way the paws meet the ground. The sensation could be compared to how it feels to wear an uncomfortable pair of shoes for the rest of your life. Also, if the claws are not removed properly or fully, it can lead to nerve damage and bone spurs. Once declawing is complete, cats need to use shredded newspaper in the litter box to protect their feet. This litter substitute combined with the pain they are feeling can lead to cats stopping use of the litter box altogether. These same cats often become biters because they can no longer use their claws for self defense. If you want to stop your cat from scratching up your home, there are a few options available. First, keep their claws trimmed so that they are less likely to damage items. Having several scratching posts around your home with different textures will likely keep your cat engaged in those instead of choosing furniture. You can also entice them with catnip and toys attached to the boards. For cats who insist on scratching around, you can always try soft plastic caps that you glue onto the cat’s nails. These fall off naturally about every six weeks, but they do not harm your cat in any way. Music for Cats proudly supports The Paw Project’s mission to end declawing in cats. We donate a portion of our profits to animal shelters and The Paw Project. We also offer our music for free to veterinary clinics and hospitals that do not practice declawing. If you are part of one of these declawing-free shelters, please reach out to us about our Music for Cats album!